Since we had kids, my husband and I have traded in our green beers and goofy Saint Patty’s day apparel for child Saint Patrick’s day activity, rock crafts, leprechauns, and super cheesy Saint Patrick’s Day baby apparel. This has been the ultimate sacrifice for my husband who is in fact a Saint Patricks Day baby. While we will likely find some time to sneak out over the weekend for some birthday celebrations and green libations, Saint Patricks Day itself will be filled with toddler and baby fun. Layla has been super into counting lately. She can count from 1-20 with ease, however counting actual objects (her understanding of one to one correspondence) could use a little work. To practice this skill we’re going to be hunting for, and counting gold coins! Prior to starting the Saint Patrick’s day activity, use a marker to label the inside of your cupcake wrappers with numbers. We will be starting with the numbers 1-10. Hide the gold coins around one room of your home, and send the kids on a hunt for them! We’ll have a small rainbow and pot to collect our gold in. 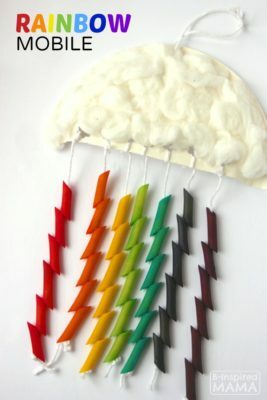 How cute are these rainbows from b-inspiredmama.com and howwelearn.com! Both would be great fine motor activities as well. Once the gold has been collected work on sorting and counting them into the appropriate tins. Make sure to have the child look at the number and tell you what it is to asses their number recognition. 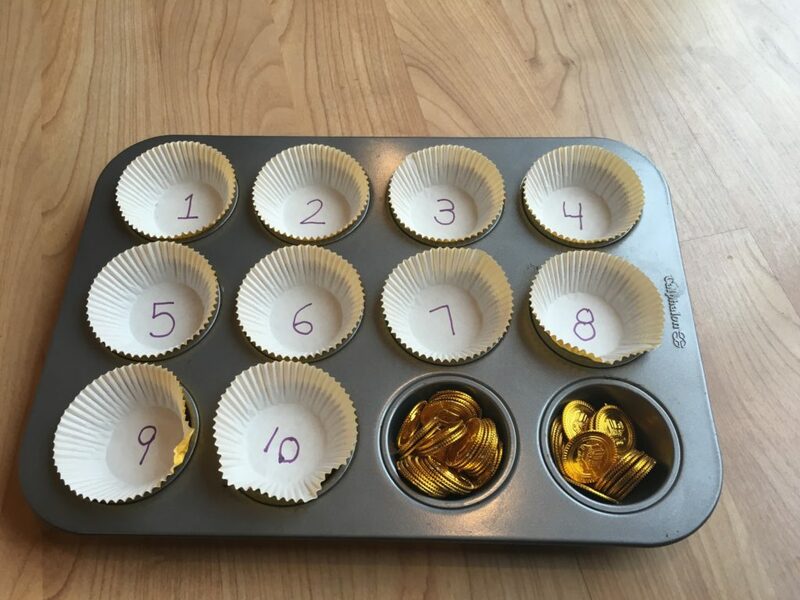 Olivia will be using the coins and muffin tins as well, however for her this will be a simple fine motor skills activity. I will place coins randomly through out the muffin tin for her to try to take out, and place back in. What else will we be doing that day? Shamrock painting and stamping, green food tasting, and more! Make sure to visit our pinterest page and click on the seasonal/holiday section for more great ideas like this Saint Patrick’s day activity! Great idea 🙂 Maybe even patterns! Omg what a fun round up!!! 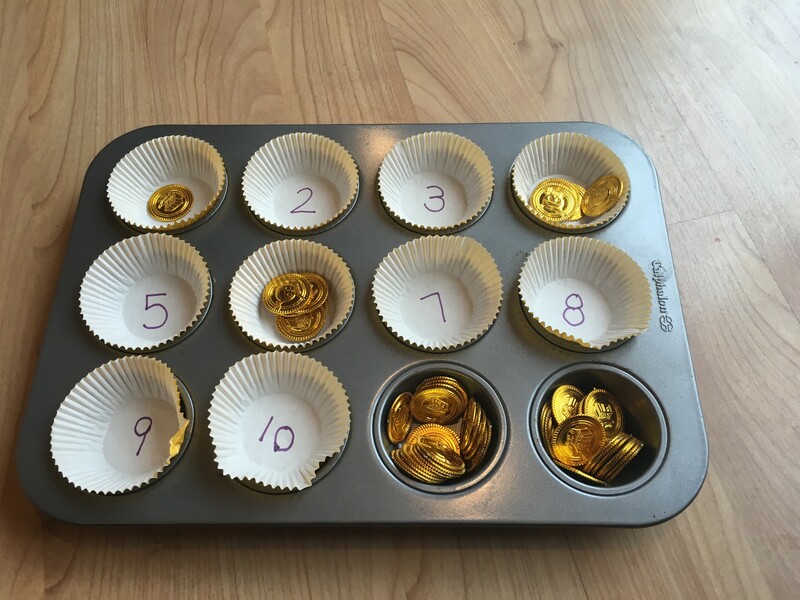 I’m loving the muffin tin coin activity. My daughter would have a blast with that! All very cute crafts! I am going to Pin some for my littlest diva next year! Loving the rainbow! Happy early birthday to your husband. These are great ideas! So cool your hubby is a St. Patty’s Day baby! 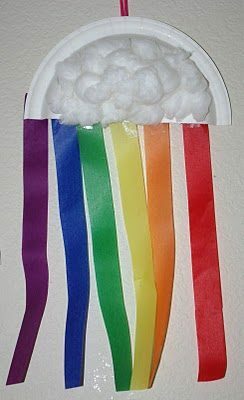 And yes, it surely isn’t as fun as pre-kids but you’ve come up with some really cute crafts! I love the pot of gold idea! How cute. I love St. Patrick’s Day and I’m looking forward to getting the kids in on some of these activities. We may not be chugging green beer, but it will still be fun. What a fun bunch of St. Patrick’s Day activities. You found a great way to use those gold coins! Super cute idea. Might copy off of ya and try it with my girls. Thanks for sharing. 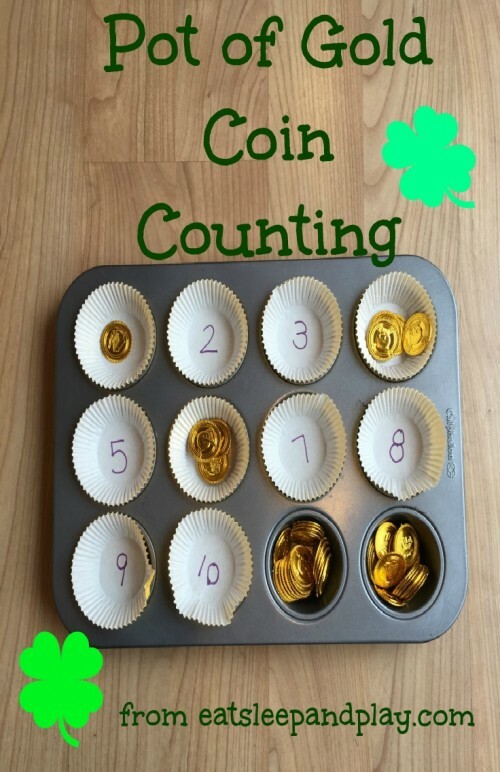 I love the Pot Of Gold Coin Counting idea! That’s awesome!